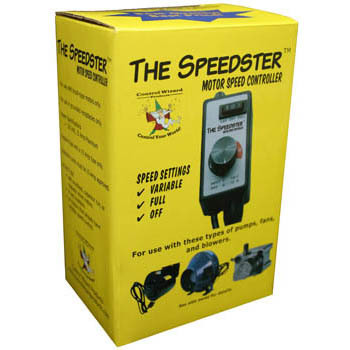 Would you like to be able to control the speed of your blower, fan or water pump? Well, you can now! The Speedster is designed for just that purpose. 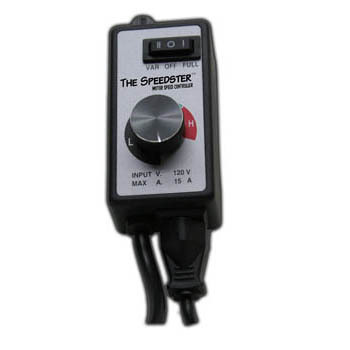 Plug the Speedster into a 120 volt wall outlet and plug your equipment directly into the Speedster. Use the knob to adjust the speed. Simple and easy to use is what Control Wizard Products designs into every piece of equipment they manufacture. The Speedster is true to that form. Comes complete with a three position switch for full ON, variable speed, and OFF. 120 volt grounded wall outlet. Maximum 15 amp draw.